In September we posted about the efforts taking place in Pakistan to provide communications for the flood relief efforts. Recently we were informed that one of the only international shipments that appears to have made it to Pakistan was from Ireland. Many thanks to Conor, EI4JN for organising the shipment, and, of course, many thanks to the donors who donated equipment and assisted with the shipping expenses. As the dual natural disasters of an erupting volcano and the aftermath of a Tsunami continue, ORARI (Organisasi Amatir Radio Indonesia) has advised how its members are providing emergency communications. He asks that the 40m frequency and the IARU Region 3 Emergency Centre of Activity Frequencies be kept clear from regular use. “We are supporting communication for rescue, first aid, medic, food and logistics. We are embedded with the local government and Ministry of Communications and Information Technology Rescue Team,” said Wisnu YB0AZ. Mount Merapi at Yogyakarta province has had a series of eruptions and claimed 138 lives. Volcanic ash air pollution is also disrupting international flights and hampering local aircraft movements delivering much needed medical and other supplies. Thousands have fled the immediate volcano area. Meantime the tsunami triggered by a 7.2 magnitude quake that hit the Mentawai Islands washed away coastal villages claiming an estimated 400 lives. Aid is yet to reach all of the remote and sparsely populated areas. Wisnu YB0AZ said that especially in the Mentawai disaster, communications support is being provided to the Indonesian Red Cross. Our thoughts are with the ORARI Communication and Rescue Task Force team members as they enter another week of providing emergency communications, often in difficult circumstances. — Jim Linton VK3PC, Chairman, IARU Region 3 Disaster Communications Committee. Following two natural disasters, an earthquake triggered tsunami, and separately an erupting volcano, radio amateurs are providing their help as the enormous response effort continues. ORARI (Organisasi Amatir Radio Indonesia) International Affairs Coordinator, Wisnu Widjaja YB0AZ has provided initial information about the involvement of radio hams in the dual disasters that hit the Indonesian archipelago this week. He said that the ORARI Communication and Rescue Task Force has joined the team of the Disaster Management of Directorate General Post and Telecommunications, Ministry of Communication and Informatics Republic of Indonesia. They have been operating in the field and provide communications support to the government and communities in the area where the eruption of Mount Merapi catastrophe at Yogyakarta province and the earthquake also followed by tsunami at Mentawai of West Sumatra,? said Wisnu YB0AZ. Media reports that at least 170 died, mostly drowned after the tsunami triggered by a 7.7 magnitude offshore earthquake struck the Mentawai islands late Monday off the west coast of Sumatra. Up to 400 others are missing. While on the island of Java, several hundred kilometres away, 29 were killed when the volcano, Mount Merapi, erupted on Tuesday releasing clouds of hot gas, rocks and laver into the air. almost 42,000 people had fled to temporary shelters around the nearby city of Yogyakarta as the area is covered in volcanic ash. The remoteness of the affected areas, poor communications, and the ongoing disaster response and relief efforts are likely to see the OARI Communication and Rescue Task Force involved for some time yet. It is planned to have a training weekend over the 13th and 14th of November on the shores of Lough Derg. This central picturesque location has been popular with other Voluntary Emergency Services for training and social activities. Attendees can arrive on Friday night or Saturday morning. Saturdays activities will include practical training and a taste of GlobalSET. It will wind down with a tour of the local RNLI station followed by dinner before moving on to the Whisky Still bar for ‘craic agus ceoil’ with local trad’ musicians. An afternoon finish on Sunday will ensure you are home early that evening. Our host, Declan EI2GE, has kindly arranged generous rates for accommodation and meals. Full details will be circulated to members in due course. The massive recovery operation continues after the 7.1 magnitude earthquake that hit Christchurch at 4.36am on Saturday 4 September, leaving a damage bill of NZ$4billion and physically injuring a few people. The Amateur Radio Emergency Communications (AREC) members quickly established an on air net and observed the operational status of the repeater systems, and apart from at least one switching to emergency power all was fine. AREC Assistant National Director, Geoff Chapman ZL3PX said designated emergency frequencies for on the 80m, 60m and 40m bands, plus 2m band simplex were activated. The Christchurch AREC Communications Bus ZK9EAC, and Comms Vehicle ZK9EAD operated on all those frequencies. They were deployed for three days in the initial recovery phase of the disaster in conjunction with the military. AREC also provided communications for the volunteer clean-up teams. The Christchurch City Civil Defence permanent radio communication systems were unaffected. AREC members have been required as radio operators. A total of eight radio amateurs are known in various support activities in Christchurch. The AREC North Canterbury Section provided operators from day one for the Civil Defence Emergency Managment Communications at various locations including Waimak EOC (Rangiora), Kaiapoi Welfare Centre, and Pines-Kairaki Welfare Centre (Pines Beach Hall). Geoff ZL3PX said this support provided by radio amateurs is continuing with over 235 duty hours so far involving about a dozen operators. Aftershocks are still being felt on an hourly basis and it is wearying to say the least. In the past week there have been 388 seismic shocks recorded ranging from 3 to 5.4 magnitude, with seismologists indicating this activity is showing signs of easing. National Crisis Management Centre in a Situation Report today listed its priorities as restoration of sewerage services in the worst-affected areas, immediate and long term welfare and housing needs, a growing demand and ongoing need for psychosocial services, business impacts and personal finances, and the need for coordinated, regular communication with the affected communities. Various specialist resources from throughout New Zealand have been assigned to the earthquake affected areas, such as building inspectors who are determining the safety of damaged homes and commercial buildings. Authorities believe that most schools should be able to open after being closed for a week. Some road infrastructure remains yet to be repaired. Most power and telephone services were quickly restored. Shops, pubs and hotels began trading for the first time in a week and Christchurch moves further into recovery mode. – IARU Region 3 Disaster Communications Committee Chairman, Jim Linton VK3PC with support from AREC Assistant National Director Geoff Chapman ZL3PX and others. The Burren walk traditionally takes place on the last Saturday of August each year. In its earlier years this event was run by an orienteering group that was about to be wound up when the Galway VHF Group and the Galway Civil Defence decided to continue to run the event themselves. The walk is a circular route from Fanore Beach car park onto a Green Road, towards Gleninagh and Black head before a descending route to the Finish at Fanore Beach car park. There are six checkpoints manned by a Radio operator and Civil Defence personnel. There are three circuits in this walk that offer a 27k, 24k and 14k loop designated the A, B, and C walks. The operation is on 80 meters as this is the only suitable means of communication across mountainous terrain. Four of the six checkpoints can be operated from vehicles and the remaining two require a good portable set up which is light enough to carry over a distance of some half an hour of a walk. Walkers were supplied with maps and directions and if all else failed they could ask the checkpoint operators to point them in the right direction. The Galway VHF Group and Civil Defence met at 08:30 am in the Fanore Beach car-park. The registration area was in a large vehicle with slide doors on one side. In the mean time, Tom EI2GP placed direction signs along the route. A quick meeting was held to designate tasks, checkpoints and operations packs to the Civil Defence and respective Radio personnel. Registration commenced from 09:00 onwards and the first few walkers were underway by 9:30. At this point each team made their way to checkpoints. Accountability for walkers is essential so the logging aspect was of paramount importance. At intervals a check-in to base occurred where the numbers we logged also. At times walkers would appear to go missing which was probably due to a delay whilst they had lunch. Sure enough they would appear at their next point eventually. There was no excuse to get lost, although many actually walked past signs as they ware so busy soaking up the scenery. The portable operators used FT817 transceivers with an output power of five watts (Peak Eenvelope Power) Single Side Band into an MP1 mini-screwdriver antenna. This is a very lightweight kit easily transportable in a rucksack. Probably the heaviest part of this station would be the lead acid gel battery. For a full day of activity a 7 AH battery is recommended. The internal battery pack is slightly short of 2 AH and seldom lasts for the full day. The mobile operators used Pro-Am whips and sufficient power to enable good readability for the duration of the event. Apart from the FT817 operators, the rest could get by on 10 watts with no difficulty. One operator was using the Tarheel mobile screwdriver on his vehicle which worked well also. Net Control would periodically update each checkpoint with the numbers of walkers that had registered until the cut off point at mid-day. One or two were sneaked in after that time on the proviso that they would not delay in the early stages. Once all walkers were accounted for at a checkpoint, 20 minutes grace was given to allow for them to turn back otherwise it was assumed they were to continue. The checkpoint could then stand down. At times a walker would decide to transfer from a shorter walk to the longer walk in which case net control would be alerted by the checkpoint in question who would then appraise the following checkpoints of the walker’s intentions. Probably the most worrying point of the walk is the last two checkpoints where walkers occasionally manage to bypass a checkpoint and it is then not possible to account for them until they are reach next point or even the finish. This year there were only a few that managed to miss the vital point at checkpoint 5. As a precaution, another point was set up along the road to take numbers of walkers passing. Often walkers do not check in at the finish point. By having the checkpoint on the road we were able to check that they were off the hills safely. It is surprising how many people purposely make it their business to bypass checkpoints. We had told them at the start that any who did not check in would have the rescue services initiated on their behalf and that they would be liable for the bill afterwards. This year none bypassed the finish line! At the end of the walk, the gear was stowed away and a final check of the site was made before leaving. All of those who participated were treated to a sumptuous feast and drink in Hyland’s Hotel in Ballyvaughan as a reward for the day’s work. In conclusion our 80 meter links worked well despite the fact that number of operators in the another country decided to establish a net on the frequency we had been using since 09:30 and then whine about the Interference from Irish stations! The FT817s can only be described as a fantastic radio with their performance surpassing all expectations, although one has to bring an additional gel cell battery as the internal battery pack is not sufficient for a long day of operating. Would be SOTA enthusiasts do take note! The days operation was very smooth and uneventful, with only one walker eluding a checkpoint but was caught at the following one. The success of this operation is generally dictated by the long periods of silence that denotes all is well. The end of walk accountability worked well and there were no excessive delays as everybody was checked in at the final checkpoints and the finish. Special thanks to the following operators: Gerry EI8DRB Checkpoint 1 and the final check along the road section, John EI7FAB Checkpoint 2, Enda EI3IS at checkpoint 3, John EI1EM on checkpoint 4, Tom Rea on Checkpoint 5, Joe EI3IX on checkpoint 6 and Steve EI5DD on registration and Net Control. Special thanks to Civil Defence who provided First Aid cover and personnel to assist at the checkpoints. The Pakistan Amateur Radio Society (PARS) reports that a cross-band emergency repeater is set to provide the first communications of its type to the flood hit Swat Valley, linking it to the rest of the country through a chain of 2-metre band repeaters. PARS emergency communications organiser Asad Marwat AP2AUM that while the linking of so many repeaters will cause a tail squelch delay, given the circumstances and lack of proper equipment it will be acceptable. A convoy of radio amateurs is relocating a repeater already installed at Changla and relocating it to Malakand Heights, so it can be linked into the emergency communications system via Nowshera. Asad AP2AUM said that a team of radio amateurs will be transporting via a helicopter a VHF base station with a high gain antenna, and subject to the availability of a 12v car battery all should be up and running. As the massive flood disaster that has ravaged Pakistan for the past month shows no signs of easing, PARS continues to collaborate with Islamabad Jeep Club members and the Pakistan Academy of Family Physicians to provide support for those affected. Some 30 radio amateurs are involved in providing emergency communications in response to the disaster estimated to have affected 20 million people and claimed 1500 lives. So far AREC (Amateur Radio Emergency Communications) volunteers have not been required in any major way to assist, following the earthquake that hit Christchurch in New Zealand. The magnitude 7.1 earthquake occurred at 4.36am local time Saturday 4 September, while most people were asleep in their homes. The result was extensive building damage in New Zealand’s second largest city, Christchurch, with only two people seriously hurt and no one reported trapped or missing. AREC Deputy Director, Geoff Chapman ZL3PX who lives in Christchurch, said that while AREC was at the Civil Defence Headquarters, there has been no requirement for it to pass any emergency traffic. That is due to restoration of telephone and power to the majority of the affected areas. While water and sewerage systems have been affected there has been no reported major loss of roads or bridges. However AREC is ready, as the situation could worsen with the weather bureau issuing a warning of very strong winds with gusts up to 130km/h and heavy rain posing new threats to already damaged buildings. Adding to the danger are numerous aftershocks with authorities advising that these will continue for many days or weeks. The ‘quake is New Zealand’s most damaging since the one which hit Napier (Hawke’s Bay) in February 1931, that saw radio amateurs extensively provide emergency communications. That led to the formation by the IARU national radio society, the New Zealand Amateur Radio Transmitters (NZART) of what is today known as AREC. Jim Linton VK3PC, Chairman, IARU Region 3, Disaster Communications Committee. The Galway Walking Club Marathon took place on the 14th of August over a 26 mile distance from Killary to Maam Bridge. 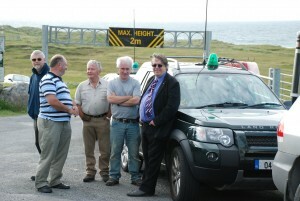 Four operators from the Galway VHF Group, operating on 80 metres, manned the 6 checkpoints. Duties included the accountability of walkers between checkpoints, the organisation of transport or medical attention for walkers who were unable to continue their walk and the organisation of additional supplies of water and refreshment to each checkpoint. A half-marathon was also run in conjunction with the main event. The HF equipment was installed in vehicles the night before the event and aerials were tuned prior to the event. At 8 am walkers were deployed from buses to the start of the walk. The operators made their way to checkpoints and were operational immediately. Whilst the 80 metre band was noisy in the early part of the day it provided excellent communications throughout the event. Transport was organised for any walker who could not continue and Civil Defence were on hand to assist with any first aid requirements. Information regarding walker who were unable to continue was passed onto the next checkpoint. At all times the number of walkers between checkpoints was known. The sweepers communicated with checkpoints via PMR handheld radios confirming that all walkers had passed through. Communication between checkpoints was excellent and an updates were easily received by all operators. Once all of the walkers had passed through a checkpoint, the operator was then free to hop to the next free checkpoint and take up position. This system worked very well and shifting band conditions had no effect on the communications throughout the day. 80 metres provided an excellent system for communication in mountainous terrain where even the most sophisticated network of VHF Repeaters would be a waste of time and effort. One frequency was used at all times and everyone was able to receive updates as required. When the event was finished two operators, driving home by different routes, remained in contact for the duration of the journey that would not have been possible by direct communication on VHF. Mobile phones were of little use due to the restrictions in coverage. Special thanks to John, EI1EM, Tom EI2GP, Steve EI5DD, and Arthur EI7GMB who operated the checkpoints at this event.